Nestled between Tiger Mountain and Rattlesnake Mountain, with their mobs users, Taylor Mountain offers a serene road hike (or bike) leading to a broad peaceful summit sans radio towers, fences, and concrete. Taylor mountain is an easy two-pointer with a few good views along the way. The route I took provided a net elevation gain of about 1,200 feet plus an additional 400 feet along the route over an 8 mile round trip. On Saturday, May 30, 2015, I got up bright and early for breakfast at the Poodle Dog in Fife, WA, about an hour south of my home. The breakfast was an informal gathering of the Pacific Northwest VHF Society. So, I used the opportunity to let people know I would doing a summit after breakfast that would include 2m and 1296 MHz, and that I would appreciate QSOs. This pretty much guaranteed a great turn-out on VHF+. I also brought along HF equipment to feed the chasers outside the Puget Sound region. The day turned out to be spectacular—one of the best hiking days of a very good hiking year. Since this hike was along forest service roads of modest grade, I dusted off my underutilized mountain bike. There are many ways to get to the summit of Taylor Mountain. I choose to start at a power line trail very close to the Tiger Mountain East parking lot (47.4663459, -121.9306254, at 1377′) on highway 18. There were “No Parking” signs at the trail head gate, so I parked at the Tiger Mountain lot. If you can find a spot in the lower parking lot, no pass is required. I arrived a little before noon, and the parking lot was a zoo with hikers and bikers ready to do battle on the trails and roads of Tiger Mountain. One of the most difficult tasks was get across a busy highway 18 with a 30 lb pack and a bicycle. I had forgotten my bike helmet, so I walked the bike along the east side of highway 18 a short distance to the trail head. 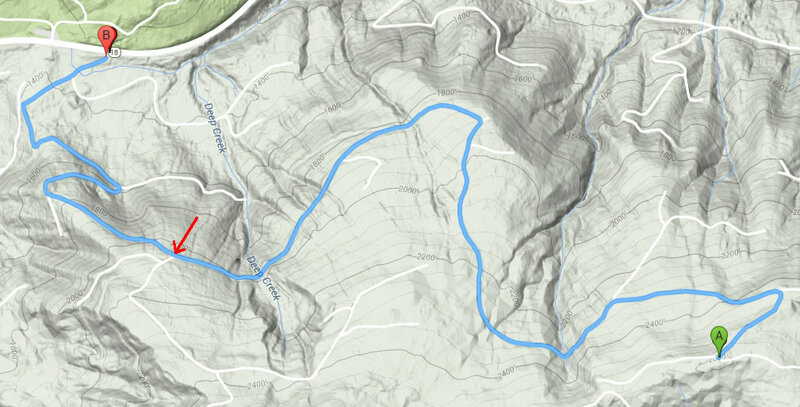 The map below shows the route (B is the start, A is the summit, and the Tiger Mountain lot can be seen in the upper left corner). After a short ride on the power line trail, a left turn heads up hill, sharply at first. The only tricky spot is marked with an arrow, when the main road takes a sharp right turn and a small road continues straight ahead and heads downhill. Take the small road, which will descend about 200′ over about a mile or so before it climbs again. The road is lightly used, judging by the growth in the center. There are a few spots along the way with lovely views to the north. The final ascent is on a steeper and softer road–I can imagine it being muddy in the wet season. Young trees line the road and the converging branches give it something of a tunnel feel. It opens up to a flat grassy area, with plenty of open space and trees for comfortable SOTA operations. The true summit is hard to identify. In fact, the activation zone is huge, and there are a number of other roads that pass through parts of the activation zone. First up was 144 MHz and 1296 MHz, using my bicycle as a mast support. I worked seventeen folks on 2m, and easily worked Jim, K7ND, on 1296 MHz FM. I tried working a couple other folks on 1296 MHz, but it wasn’t to be. The 90 minute stay concluded working 9 folks on 17m. I took my time going home and stopped a few time to enjoy the sights and the weather.